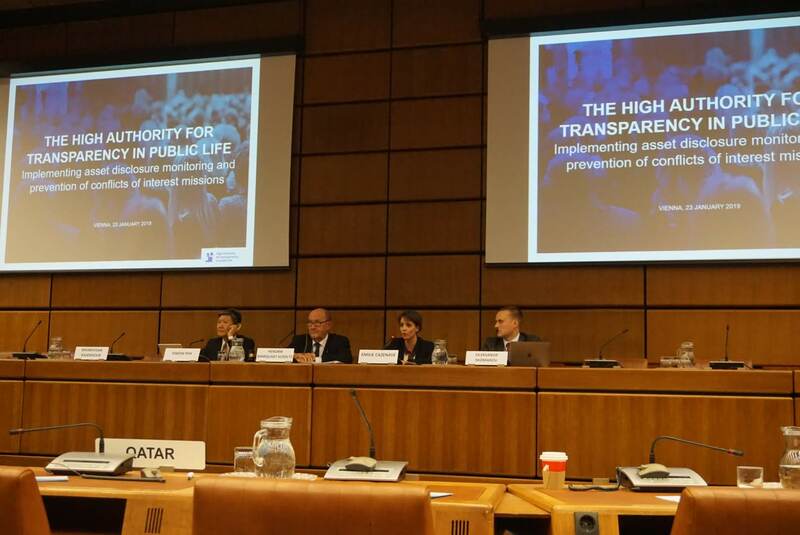 The 10th conference of the International association of anticorruption authorities (IAACA) gathered from 22 to 24 January 2019, at the Vienna International Center, with the support of the United Nations office against drugs and crime (UNODC). This platform, which was created in 2006, aims to foster experience sharing and cooperation between anticorruption authorities, as mentioned in the commitments taken by State parties to the United Nations Convention against corruption. Beyond the general meeting of the association on 22 January, during this tenth conference, a new format divided into panels was preferred in order to discuss topics covered by the Convention and implemented by the different State parties represented. Three panels were organized on 23 January. The first one covered the United Nations convention as an infrastructure for the achievement of the United Nations agenda 2030 for sustainable development composed of 17 sustainable development goals and notably sustainable development goal n°16 for “effective and accountable institutions at all levels”. The second panel allowed to mention initiatives in the field of education against corruption, highlighting tools developed or being developed by the UNODC and available online and their use and adaptation to specific national and academic contexts. Emilie Cazenave, International partnerships coordinator at the High Authority, intervened in the third panel on asset declarations and prevention of conflicts of interest. Her presentation focused notably on the concrete results after implementing for five years the French Laws of 11 October 2013. The directors and deputy directors of the authorities of Hong Kong, Thailand and Ukraine also described the policies recently implemented in their national public sector, such as the « No-gift policy » in Thailand, the investigations led in Ukraine against very high-ranking public officials on the basis of their declarations of assets or ethics officers’ training in Hong Kong. The audience was peculiarly interested in the no-gift policy in Thailand and the control procedure or the necessary balance found by the High Authority between the publishing the content of some declarations and respecting privacy of the public officials concerned. On 24 January, the last panel allowed to discuss asset recovery before closing the conference with the speeches of its President, Dr. Al Marri, its vice-president, Mr. Vetere, and the executive director of the UNODC, Mr. Fedotov. In parallel to the panels, the informal discussions between participants highlighted an increasing will to opt for online disclosure of assets and interests, a technical modality that became mandatory in France in 2016 and was of high interest to many delegations represented. Moreover, all discussions recalled the importance of public officials’ commitment at the highest level of the State and the need to keep exchanging to mutually strengthen national integrity and anticorruption systems.